It’s officially the middle of April and all sorts of stores have awesome deals on their cleaning supplies. I’ve even seen awesome deals on storage units banking on the fact that Americans love Spring cleaning. Time to organize the attic or basement, deep clean, buy new towels, and give away of all the junk you don’t use to Good Will. If you need help cleaning your home you can have a Brisbane single visit clean come and do it for you. 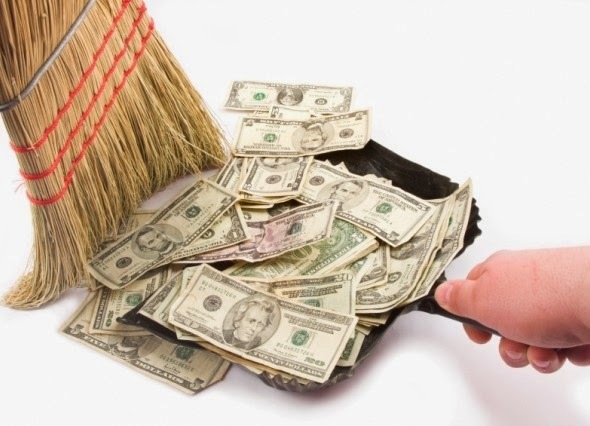 Sure, this is all great to cleanse the house, but what about your finances? 50% of Americans have less than one month’s income saved for a rainy day. Top personal finance advisers will tell you – and especially drawing from lessons in the economic crisis to have at least six months income saved, just in case – no need in the merchant cash advance company service. 56% of people have no idea their credit score is which happens to be the most important factor for applying for a mortgage, car loan and new credit card. 57% of households don’t have a budget according to a recent study by Harris interactive. 61% of Americans live paycheck to paycheck, more than one in five earn US$100K or more. Those numbers are pretty scary, especially for the American who is making more but spending even more. So, what does this all mean? American are spending way more than they earn and do not have control over their finances. So the question is, how can you avoid becoming one of these statistics? Or, how can you change yourself if you already are that statistic? Well, here it is: Get in control! Spring time is the American’s yearly “designated time” to deep clean. 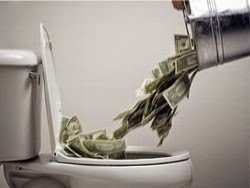 So, lets do what we have to do to get your finances “deep cleaned” and then form some new habits. Here is a list that can help you get started. and put it FIRST over every other bill in the house. Even over rent. Use awesome apps like mint or level money to keep on top of your budgeting game. You need to get in the habit of looking at what you are spending on often. Credit Karma is an awesome site that lets you view your credit report free once a year. I highly recommend it and use it myself. If you have not seen what is going on in your credit report, I suggest you do. Being a victim of identity theft myself, I cannot tell you enough how important it is to not turn a blind eye to your credit report. This helps you avoid any late fees or penalties from forgetting to pay your bill on time. This also keeps you on check for knowing dates of when money will be taken out of your account and so on. Get in the habit of making your savings and bills a priority. You do not want to be throwing money away to fees when you could be putting that money towards savings. This also does not give you the excuse to pay and forget about it. Always review your bill because errors do happen and you don’t want to be paying for something that you shouldn’t be paying for. offers a high yield savings account and its free with no minimums. I love using Mint for the very reason that I can check what I have spent on certain categories. Check your bank records and find out what fees are being charged to your account so it can stay open. Sometimes banks charge a fee if you do not have a certain amount in savings. Look into that, that could be money you are throwing away simply because you do not know or have not looked into it. Also, shop around. There are so many banks now that offer no ATM fees, no banks fees, and so on. Do your research. If you have an IRA are you contributing the full $5,500(or $6,500 for 50 and older) a year that can be? If not, you are wasting your time on it! Tell yourself that you will transfer a certain amount of income to your Roth IRA or whatever account you have so you can build your net worth. Don’t forget to evaluate what you are putting your money into in the IRA as well and don’t just let your money sit in there. Put it into something that is building strong long term. How much are you spending on your insurances? It’s like GEICO always says, fifteen minutes could save you 15% or more on car insurance. Spend this time to shop around to see if you can get better rates. If you have good discipline, take that difference that you save and put it away. Or you can always add it back into your budget so you can start getting your nails done again. God knows all the crazy things that get lost in our purses. Outdated makeup, old receipts, baby snacks, change, old lotion, I mean I go on for a while. Clean all that out! Who knows what you have lost in there. Take the change and put in back into your savings. That’s just money sitting there that is accruing no interest and that’s no good. Go grab some manila envelopes and put all those crinkled up old papers somewhere. Car insurance records, finance records, social security cards, passports, rental agreements, bank records, cell phone bills, etc should all be put away and organized. Wal-Mart sells filing cabinets for around forty bucks. Invest in your organization and the rest of the years on will go much more smoothly. I love couponing. It’s quite addicting when you figure it out and you see all the money that you save. It helps so much with keeping the budget together. It’s all about getting organized with that as well, and staying on top of sales. Never buying anything that isn’t on sale, and being patient. There are so many resources out there that will help you master couponing and I highly recommend it. Start now by checking out my Coupons Savings Center and get your print on! Hope all these helped. Don’t get too overwhelmed, just take it one day at a time. Make sure to let me know if any of these tips helped you, and don’t forget to like, comment, and share this article with all your friends so they can save too! Erika Belvin is the author and founder of www.BizyMommy.com She is a full time mommy to a beautiful little girl, a mother to two puppies, and a wife to a full time network marketer. She is a big time foodie, and a lover of anything that has cake in it. Life’s a beach. Follow her on Facebook, Twitter, Instagram, and Snapchat.